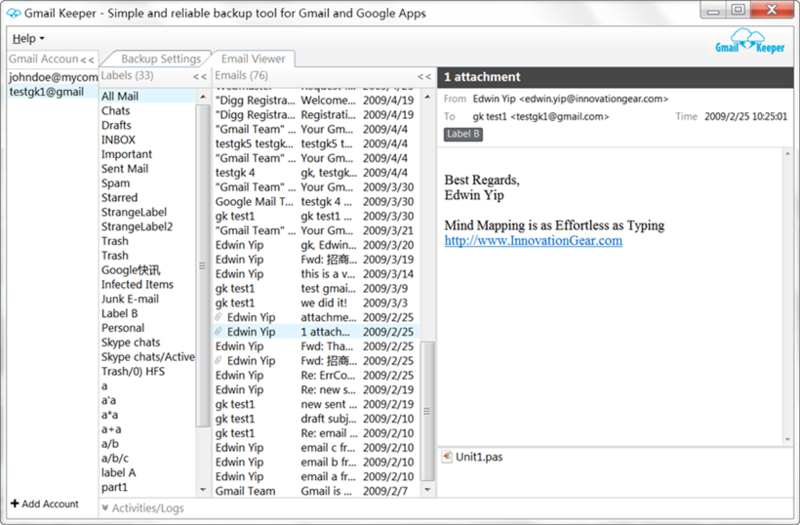 is a complete redesigned backup tool for Gmail and Google Apps, and is meant to replace GmailKeeper. The vision is that OwnMyCopy will be the all-in-one, to-your-computer backup tool for online data stored in various web services. >> Check how it compares with GmailKeeper. Note: There will be a slight price increase and the version for Google Apps will be separated and will be priced differently. So you might want to buy Gmail Keeper now and get the upgrade in your free upgrade period when this new version is out. If the release is delayed, your free upgrade period will be extended accordingly. As the following screenshot (a connection test that you can perform once you have created a backup jo) shows, the upcoming brand new GmailKeeper has a better logging ability. The better logging function is for improving the quality of this Gmail backup tool that backs up e-mail data from the Gmail IMAP servers. When a problem come to a program like GmailKeeper, the sources are not limited to the program itself or the user’s computer, but it might be the Internet connection, or more frequently, the Gmail IMAP4 servers. So a better logging will definitely help solving a problem and improve the quality of this Google Apps and Gmail backup software for Windows. 18:46:22.907 The connection test is started! 18:46:27.346 Login failed! Is your user name and password correct? 18:46:27.348 Background testing thread has finished. By “new Gmail Keeper” I mean a completely rewritten version of this Gmail backup tool, I think you can tell by the new user interface. The new email viewer is a simple, Gmail-Web-alike viewer for the backup data – including the Gmail labels, the email themselves and the email attachments (open with associated, external programs, eg your MS Word). The brand new version of Gmail Keeper will also address many of the problems in the current version, for example, the 4GB zip file size limit will be gone. I’ll cover more details in the upcoming blog posts. PS: There will be a slight price increase and the version for Google Apps will be separated and will be priced differently. So you might want to buy Gmail Keeper now and get the upgrade in your free upgrade period when this new version is out. And of course, there will be a special price for current GmailKeeper users. BTW, the old plan for the new version of this gmail backup software was different – it was a run-locally-web-based software, and that plan had led to a new project of mine – LIVEditor (a real-time html/css/js code editor). And I changed my plan as you can see in the video. I’ll reveal more details on this in the future.